Call for our concert specials on all nights! First Class Limos, Concert transportation to Blossom Music Center, The Wolstein Center, Browns Stadium, Q arena / Gund Arena and more. Our luxury sedans buy 4 hours get 1 free -5 hours comes to a total of $275 plus tax/tip. Our sedans are available for pick ups, drop offs, hourly blocks, any kind of transportation needs if possible. Our 8-10 passenger stretch limos rent out hourly - Buy 4 hours and get 1 free. 5 hours total comes to $275 plus tax/tip. This is only $30 per person for 10 people! Our 10-11 passenger 2007 chrysler 300 limo - Buy 4 hours and get 1 free. 5 hours total comes to $349 plus tax/tip. This is only $43 per person for 10 people! 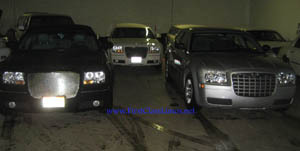 Our 11-12 passenger 2010 chrysler 300 limo with Lamborghini doors and a lighted dance floor - Buy 4 hours and get 1 free. 5 hours total comes to $395 plus tax/tip. This is only $48 per person for 10 people! The 16 passenger Navigator Limousine rents out for 4 hours plus 1 free comes to a total of $399 plus tax/tip. This is only $31 per person for 16 people! Our Hummer limos and Escalade limos with lighted dance floors rent out for 4 hours plus 1 free comes to $425 plus tax/tip. This is only $28 per person for 20 people. So ride in style and at ease with First Class Limos.